THURSDAY JANUARY 20, 2011 , 7 p.m.
MEETING OPENED by Judy Jeffery welcoming in a new year with a strong desire to “just get out in the garden!” Judy also introduced new members George and Angelina Vrkjan. There were 26 members present. MINUTES of November 2010 and the newsletter were handed out to each member, thus the reading of the minutes was passed. Haldimand Agriculture Community Centre is holding a seminar on how to attract birds to your garden on Jan. 23, at 1:30 . Seedy Saturday is at Ball’s Falls on Feb. 12. Everyone was encouraged to attend this popular and worthwhile event. SECRETARY POSITION is now open to anyone interested in taking over for Doris Thomson. Doris unfortunately had to step down due to personal reasons and will be missed. She was very valuable to the board and contributed immensely. Until a replacement is found, the duties will be divided between Pat Taylor-Van Natter and Kim Christoff. NEW AGENDA, designed by Ian Steel was handed out to all members. Done on coloured cardstock, it outlined as many dates as we could confirm at time of printing. Thanks Ian, for a job well done. TREASURER’S REPORT for December was read by Kim Christoff showing a membership of 93. Kim asked that this report be accepted as read and motion was seconded by Linda Muldoon. FISCAL YEAR END REPORT was read by Don Davis in lieu of the auditor Craig Starrs who hails from Hamilton and thus was not feasible to have him attend. Don read the Income/Expense report, the Balance sheet, Profit and Loss Statement and the Auditor’s report. (Copies attached) Thanks Don. A motion was made by Maura Cooper to have this report accepted as read and it was seconded by Helen Edl. 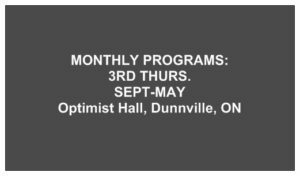 Judy explained that although we showed a loss for the year, it was from monies received prior and was spent on different projects through Dunnville. We contributed to the new Downtown Fountain, we will be donating $1000 to the Mud Cat festival this year and have agreed to contribute $1000 toward the cost of planting new trees at Grandview Lodge. It was asked of the members to forward any ideas for more projects that we could get involved in and ways of getting more funds. INTERMISSION was held with refreshments provided by Annette Dodge and Kim Christoff. Annette has taken on the responsibility of organizing and maintaining the refreshment area. Anyone wishing to help out one month should sign up in the book that is always on the counter. WAYS AND MEANS was run by Betty Ballanger and raised $35. Thanks Betty. Meeting was adjourned. Next meeting will be held on Thursday February 20, 2011 .